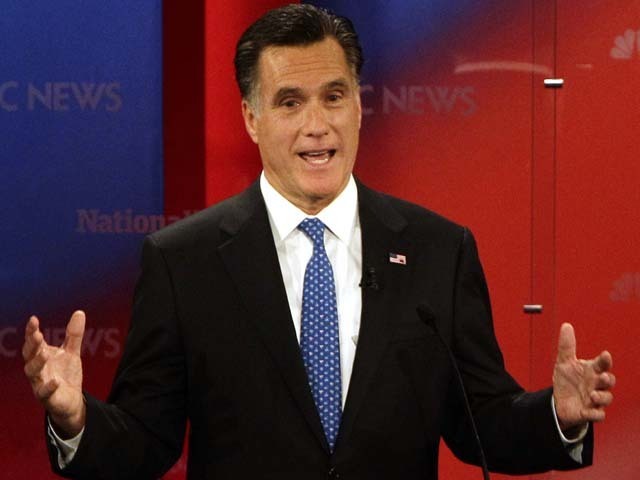 Romney on immigration: I'm for "self-deportation"
In Monday night's Republican presidential debate out of Florida, Mitt Romney described his plan for reducing the number of undocumented immigrants in the U.S.: "self-deportation." The former Massachusetts governor was responding to a question about his immigration position by Adam Smith, the political editor at "The Tampa Bay Times," who said he was "confused" about his stance on deportation. "Governor Romney, there is one thing I'm confused about. You say you don't want to go and round up people and deport them, but you also say that they would have to go back to their home countries and then apply for citizenship. So, if you don't deport them, how do you send them home?" Smith asked. Romney said "we're not going to round people up" but rather, financially struggling undocumented immigrants would choose to return to their home countries of their own volition. "The answer is self-deportation, which is people decide they can do better by going home because they can't find work here because they don't have legal documentation to allow them to work here," he said. "And so we're not going to round people up." The former governor explained: "The way that we have in this society is to say, look, people who have come here legally would, under my plan, be given a transition period and the opportunity during that transition period to work here, but when that transition period was over, they would no longer have the documentation to allow them to work in this country. At that point, they can decide whether to remain or whether to return home and to apply for legal residency in the United States, get in line with everybody else. And I know people think but that's not fair to those that have come here illegally." "Isn't that what we have now?" asked Smith, who pointed out that "If somebody doesn't feel they have the opportunity in America, they can go back any time they want to." Romney suggested his administration would make it harder for illegal immigrants to get jobs, which would in turn lead them to seek work elsewhere. "We'd have a card that indicates who's here illegally," he said. "And if people are not able to have a card, and have through an E-Verify system determine that they are here illegally, then they're going to find they can't get work here. And if people don't get work here, they're going to self-deport to a place where they can get work." He said that then people could "get in line at home" and come to the country legally once they "reached the front of the line." Earlier in the discussion, Romney said that, like Gingrich, he would support a version of legislation that would allow some young immigrants, brought to the country illegally, to earn citizenship by serving in the military. "That's the same position that I have, and that is that I would not sign the DREAM Act as it currently exists, but I would sign the DREAM Act if it were focused on military service," Romney said, echoing Gingrich's stated position on the topic. The issue of immigration is likely to play a huge factor this election in Florida, a diverse state with an increasingly large Hispanic population. In the Republican nomination contest, Gingrich has taken a softer position on the issue than his rival: the former speaker has favored granting amnesty to those who have lived in the country for a long time and have families here; Romney, on the other hand, has recently said such a policy would encourage illegal immigration.